Can we be honest for a sec? My familiarity with baroque opera has been left somewhat wanting due to popular-packed company seasons over the past couple of decades. Over the years, Rigolettos, Elixers, Flutes, Barbers and Toscas have flooded many a dusty, autographed playbill sitting entombed upon the avid pseudo-musicians’ piano tops and bookshelves. Albeit, there has been a sort of resurgence in Handel over the past five years, but all-in-all Baroque remains wishful thinking among the fiscal planning of a company. With regards to French Baroque, such sentiments are only doubled. Last Monday, Glimmerglass Opera shed a little insight as to why companies all around the US should not just consider French Baroque, but excitedly leap upon the opportunity to bring the right Baroque content to their audiences. And, why not? Simpler sets and a smaller orchestra could, perhaps, provide budget-conscious companies the ability to take it a tad easier on costs. Glimmerglass, on the other hand, pulled out all the stops in their production of Jean-Baptiste Lully’s Armide, showing just how vital this particular genre can be to opera. Choice: love/hate? Enchantress tricks enemy 2 love. Lovin had. Spell breaks, tenor leaves, mad scene, ruined castle. Love (or…hate?) reigns. The young cast was, for the most part, fantastic. Sopranos, Mireille Asselin and Meghan Lindsay, were successful in their respective roles of Phenice/Lucinde and Sidonie/Water Nymph. Both voices are sweet and youthful. Lindsay possesses an agile mezzo voice Lindsay’s brassy lyric soprano voice is invitingly agile, as she craftily explores her two roles with different colors and tactics. Joao Fernandes, Hidraot, has a robust baritone with incredible potential in the role, but at some points it seemed as if less air were needed to achieve the hearty sound he was looking for as he portrayed the powerful sorcerer and uncle of Armide. Speaking of Armide, Peggy Kriha Dye was absolutely stunning. Her full-throttle approach to French Baroque was surprisingly successful as she masterfully tackled the subtle nuances of the genre never sacrificing the romantic and lyrical quality needed. In particular, her mad scenes at the end of Acts II and V were spell-binding. One forgave the occasional rough and grinded attack during highly dramatic singing due to her uncanny ability to emote with immense vocal color. Kriha Dye’s counterpart, Colin Ainsworth, plays the unfortunate, spell-tossed Christian knight, Renaud, with beautiful confidence and a hearty sound. His skillful negotiation of high tessitura and sweet lyrical tone while maintaining core and strength was brilliant; it added much character to his role. It must be pointed out that, although the entire cast seemed well prepared for body movement for the 17th century French stage, Ainsworth was by far the most successful in naturally utilizing hand gestures, postures and expressions at the appropriate times. Special attention must be called to the knights, Ubalde and Chevalier, for the very much welcomed comedic relief in the latter half of the show. Played by Olivier Laquerre and Aaron Ferguson, respectively, this slap-stick duo is a highlight of an already stellar production. Laquerre plays a love-deprived knight with delightful awkwardness and has a husky, dark baritone voice to boot. Ferguson enacted a hilariously giddy schoolboy approach to his knight and used his firm and focused tenor to almost always get his way. An act worthy of Monty Python, if the whole opera thing goes south, these two guys could easily land roles in Spamalot! But we’re happy you’re on the classical side of things. The orchestra, under the fluttery hands of Maestro David Fallis, was precise and balanced. The continuo proved to be quite effective in producing the unmistakable Baroque atmosphere. The production team must be ever so proud of their work here. The thought-provoking set held true to Baroque form with basic wooden wings and drops, but the hints of modern influence were effective in creating a storybook feel. The wooden side drops in the third act looked like they were taken straight from the background of the Tale of the Three Brothers; a cartoon that shows up in Harry Potter’s Deathly Hallows as a fairytale for wizard children. The costumes by Dora Rust D’Eye were bright, colorful and beautiful and were especially noticeable during the ballet sections where dancers weaved through singers (and vice versa) creating wave-like pattern of color. Choreographer, Jeannette Lajeunesse Zingg, is brilliant in creating even synergy on stage between the dancers and singers. She remains true to the drama at all times. A special note must be also given to chorus master, David Moody, as the lofted chorus rang gorgeously throughout the hall. Bravo to the entire Glimmerglass team – a glorious performance! 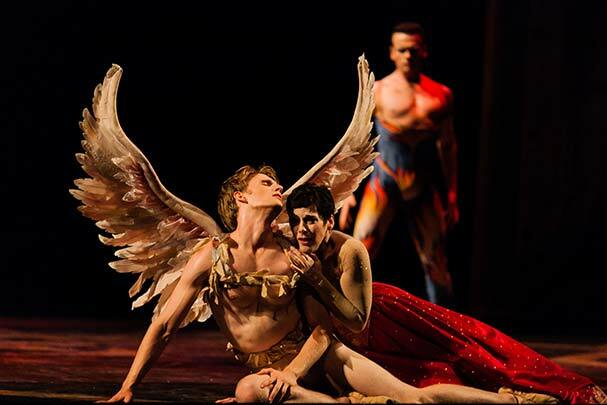 **You can catch the last performance of Glimmerglass’ Armide this Thursday, August 23rd. A quick correction- Meghan Lindsay is a lyric soprano, not a mezzo. Tis true, thanks for the correction. Thanks! The correction has been made. This is a co-production with Toronto’s Opera Athelia. This was first performed in Toronto in April and then at Versailles, France in June. Bravo Glimmerglass and Athelia for this superb performance of French Baroque Opera.